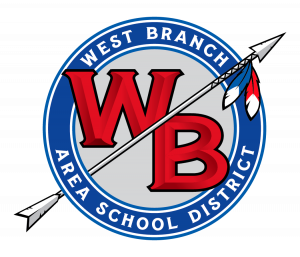 Starting with the 2016-2017 school year, the West Branch School District logo will be standardized. All use of the West Branch school district logos will need to approved by the School Board due it’s trademark status. All, Booster Clubs and PTO committees, that are in good standing with the district, have the ability to use the logo upon request. For more information on fair use policy, please read the following article Here. • Logo marks can been provided in vector EPS and bitmapped PNG formats. • Logo marks can been provided in color, grayscale, black and in color with an outline for use on dark backgrounds. These outlined files are titled “reversed”, see circle logo with gray background above. • When any mark appear as a light application against a dark background, use the reversed artwork. • The proportionate size of the marks in conjunction with accent elements may not be altered. • Colors on the primary marks may not be reversed. The WB must always be red.